Here's another little Halloween treat that is so quick and easy to make. I am having a lot of fun playing with the Candy Wrapper Die for the Big Shot that is available in the Stampin' Up! Holiday Mini Catalog right now. For this Candy Wrapper, I just wrapped a strip of Rich Razzleberry cardstock that I embossed with the Spider Web Embossing Folder. Then tied the ends closed with the narrow Rich Razzleberry Taffeta Ribbon. I stamped the tag from one of the many sentiments in Tiny Tags and layered it onto a few more Jewelry Punch tags, then tied it on with a piece of Hemp. The finished Candy Wrapper piece is about 1.5" x 2". Here's a picture of it next to the Tombow Mono Multi Adhesive to give you an idea of the actual size. This is the adhesive I use to close my Candy Wrapper. Another strong adhesive that would work well is the 1/4" Sticky Strip. A tip to creating these Candy Wrappers is after you run the cardstock through the Big Shot with the Candy Wrapper die, be sure to fold and crease every score line before adhering the end. Here is no sentiment card with some sparkle from the Rhinestone Jewels and just a bit of stamping from Baroque Motif stamp set. I just love this pattern paper from the Lap of Luxury Designer Series Paper and wanted this card to feature that element. I stamped the edge of the large flourish image from Baroque Motif in Elegant Eggplant ink onto a piece of Very Vanilla cardstock. Then I stamped it offset just a little in VersaMark ink and embossed it with Iridescent Ice Embossing Powder. This is punched out with the 1 3/4" Circle Punch and edged with Two Way Glue Pen and Dazzling Diamonds. A few layers of paper from Lap of Luxury and a beautiful Basic Gray Satin Ribbon bow finished it off with corners of Rhinestone Jewels. Here's a quick and easy Halloween giftie that I made last week with the fun little Spider Web Textured Embossing Folder from the Stampin' Up! Holiday Mini Catalog. I had made some fudge and placed it this little tin which I lined with some parchment paper. For the tag, I ran a piece of Perfect Plum cardstock through the Big Shot with the Scallop Square Die. Then I placed that square die cut back into the die, with a few of the scallops overlapping the edge and ran it through again. From that two step process I go this Rectangle Scallop, which I promptly ran through the Big Shot again with the Spider Web Embossing Folder. Finally I took a Sponge Dauber and swiped some Frost White Shimmer Paint over the raised webbing to give it some shimmer and make it pop. 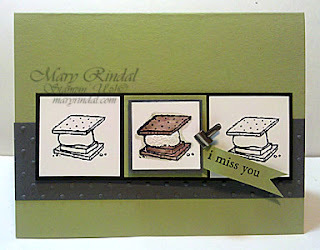 I stamped with Holly's Color Roundup #6 and the Sketch Challenge over at Stampin' Addicts this morning. What a great sketch - I always love working with Paula's sketches and it sure made this card come together quickly. This is the s'more image from Under the Stars and I only colored one of them and popped it up on some extra mats as well. The sentiment is from Three Little Words and I adhered it to the back of the center mat and then clipped on one of the Mini Library Clips - I adore these! The ColourQ Challenge posted two color palettes today - Basic Black, Poppy Parade, Tangerine Tango, River Rock and Basic Black, Regal Rose, Pretty in Pink, Pink Pirouette. I stamped both my cards using the same stamps from Just Believe, in identical layouts - the sketch from Stamping 411- and with no embellishments! But look how different each card is with the different color combinations. I stamped the first card using the wildflowers image from Just Believe and the Painting with Embossing Powder Technique that I learned this week from Papers and Pixels Online Magazine. It makes a beautiful impact on the River Rock cardstock. I stamped the second card using the wildflowers image from Just Believe and a Brayered Background technique. Again, a beautiful image, but a very different look than the first card. Today I stamped another PINK card in honor of October Breast Cancer Awareness Month and used my Stampin' Up Birthday Bakery set. This is a Hostess Level I stamp set that I just love - it has such adorable sentiments and those fabulous cake images! I also used the Mojo Monday Sketch 161 today - what a fun layout they have! I repeatedly stamped the line-up of cakes for the background and then embossed a partial image in Melon Mambo ink and Clear Embossing Powder. 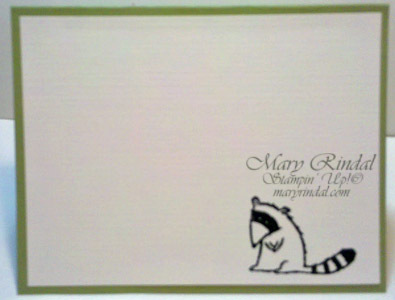 This embossed image is punched out with the Oval Punch and just a bit more pink and coloring added to it. The sentiment below is also Clear Embossed, which gives it such a great shiny look and feel. 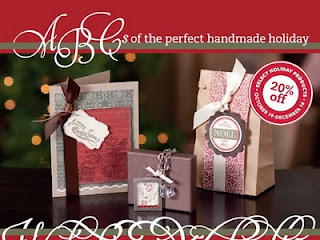 From October 19-December 16, choose from several different holiday bundles containing gorgeous Stampin’ Up!® products—perfect for creating cards, gift packaging, and gifts—and all at 20% off! I'm doing LOTS of stamping today with my customers at my annual Christmas Stamp A Stack. What's on your stamping list for this weekend? How about this super quick and easy treat holder? I made this one for the Stampin' Addicts 3D Challenge - Scallop Square Candy Holder. The Paper Chrysanthemum here is one of the things we'll make at Technique Club on Monday. Happy Stampin'! Enjoy your weekend! Here's another card I stamped this week, again using the Mojo Monday sketch. I used a Stampin' Up! Hostess Level I set called Birthday Bakery. I just love the cupcake images in this set and the sentiments are too darling! I used my Big Shot for a few elements here, including the tab of Melon Mambo from the edge of the Top Note Die. Also the Polka Dot Embossing Folder for the background. The small flowers are punched with the flower punch from the Itty Bitty Punches and then stacked up and poked with a Paper Piercer and finally a Vanilla brad from the Neutral Brads. And I always love layering a sentiment with the Word Window Punch and the Modern Label Punch and then dangling it from a ribbon knot or bow. This is a card that I stamped with the Pick A Petal stamp set from Stampin' Up! a few weeks ago. The card base is Poppy Parade, which is such a lovely shade of red! I did not include a sentiment on this card intentionally, although sometimes it is hard for me to leave that off! These Flower Brads are currently on the Clearance Rack along with so many other beautiful retired products at up to 80% off! Be sure to check there daily this month as Stampin' Up! clears out some warehouse space for incoming new product. Go to my Stampin' Up! website and then choose Shop Now in the upper right corner to view the Clearance Rack Items currently available - all items in the Clearance Rack are only available while supplies last.